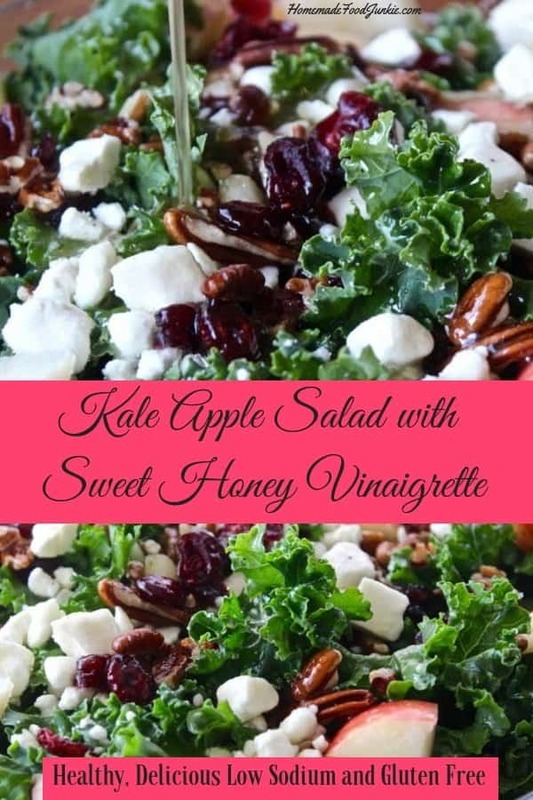 Delicious Kale Apple salad is dressed with a tasty sweet honey vinaigrette. Pops of feta cheese and cranberries laced throughout add tangy flavor. This healthy kale salad recipe is Low-Sodium and Gluten-Free. 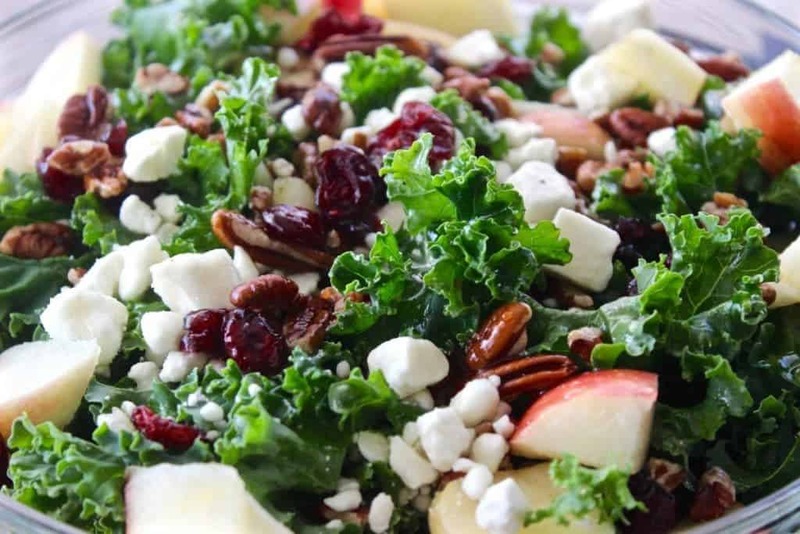 This delicious Kale Apple salad is dressed with a delicious honey vinaigrette and has pops of feta cheese and cranberries laced throughout. It’s Harvest time. Dad keeps loading us up with kale greens, fall garden vegetables and apples. When his Fall garden vegetables are ripe we all start making delicious apple recipes, butternut soups , pumpkin pies and Fall garden Kale salads. Our Spring Garden Berry Salad and Spinach,avocado,bacon and Feta salad are healthy show stopping green salad recipes full of nutritious ingredients to fill out your meal plan. Be sure to take a look. Salad recipes are SO inspiring! I’m a closet kale salad lover. You would never know that by looking at the posts I usually write. You would probably believe I’m a CARB QUEEN though. My cupcakes and delicious casseroles are recipes best eaten sparingly if you value a tiny waistline. I really do enjoy nice crunchy dinner salad recipes that are bursting with flavor along with my carbs. My gallbladder went south on me while I was in the military. It had to come out! Ever since I lost it, digesting foods with a higher fat content and foods that are at all greasy is a real challenge. Like painful! So you know I’m not eating MUCH of those cupcakes and casseroles I love to make. My hubby gets the lion’s share of them while I take a nibble. 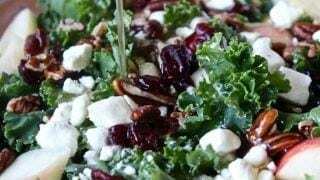 This sweet kale salad with cranberries keeps my sweet tooth tamed and my guts happy too. It also has a sweet honey dressing that helps to satisfy my desire for naughty (full of fats) sweet desserts. I don’t have to worry about gluten free. but if you do, this gluten free salad dressing is for you. 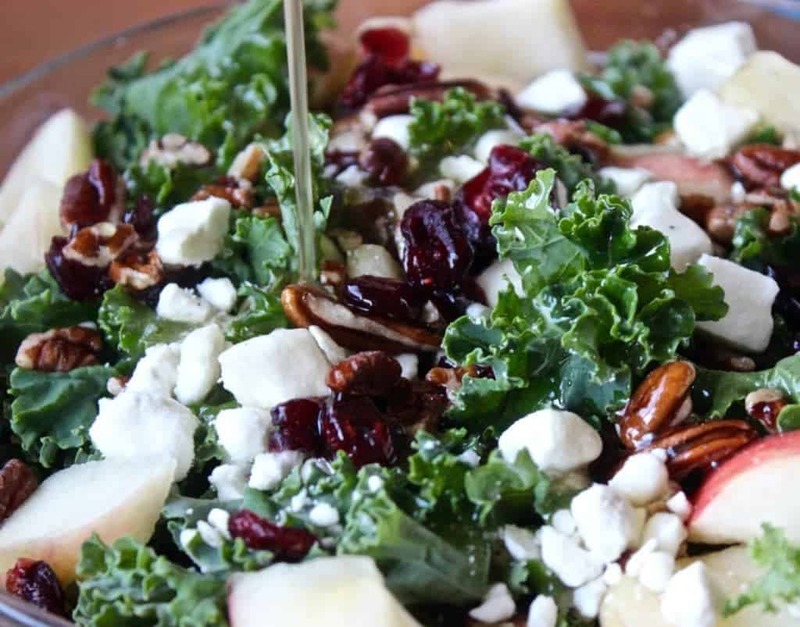 Enjoy a healthy salad dressing over a kale apple salad. It rocks! Kale is truly an amazing leafy green with a very high chewing satisfaction. It grows nearly year around so it’s always fresh in the stores in many varieties, texture and colors. It’s tough leaf is FULL of wonderful nutrients that have kept people from starving through the winter for thousands of years. It has a flavor that lends itself well to many ingredient additions and works well with both sweet and piquant dressings. Kale leaves have a good structure that makes a springy satisfying salad base. Healthy salad recipes with Kale hold up well in the fridge too. Just wait to serving time to dress them for the very best results. Looking for more kale Salad ideas for dinner? Try our Fall Garden Kale Salad. It’s amazing with our Creamy Balsamic Dressing too! This kale apple salad with our honey dressing is just the ticket for clean eating! It’s very filling, light and healthy. It’s fiber rich and gluten free. Don’t settle for store bought salad dressings. Take a minute and make your own healthy homemade salad dressing. It’s SO worth it. Apples, pecans, kale, and cranberries go well together. I’m putting all of them into this garden salad. Pears would make a nice counterpoint to the apples. Someday, I’ll add them in but not this time. We prefer our raw kale leaves just as they come out of the garden. EXCEPT we ALWAYS pull the leafy part off the kale ribs. The ribs are tough and VERY chewy. Cut them off! Kale is springy and resilient so it does require chewing. This is a plus for feeling full and satisfied. If you’re not into a leaf that fights back a bit when you chew it, you may wish to soften the kale before making it into a salad. This honey salad dressing recipe is acidic. If you make the salad in a large bowl and dress it ahead of serving time (say an hour or so) the acids in the dressing will break down the leaves enough to soften them without messaging. Then your ready to serve without all that extra fussing. Massage kale salad for a softer leaf texture with less spring and structure in the leaf. NOTE: DO NOT massage Baby kale. You know, the little kale leaves in the tubs at the market. They are already quite tender and that saves you the work. Also messaging kale means your salad is ready to serve and won’t hold well for long. Message the leaves, make the salad and SERVE. Be sure to Message the kale leaves BEFORE cutting them into salad bite sized pieces. It’s MUCH easier. Remove tough kale leaf from the ribs by cutting along side the ribs or stripping the leaves off with your fingers. OPTIONAL: Sprinkle the leaves with a bit of kosher salt, olive oil or vinegar or lemon juice to aid the process. It will brighten the leaf taste in the salad. Massage the whole leaf one at a time . Pick up the leaves gently between your thumbs and fingers. Gently massage the kale between your fingers until you feel the leaf start to soften. Massage the leaves until you like the softened texture. DON’T over do it. Or your salad will be unpalatable and mushy. 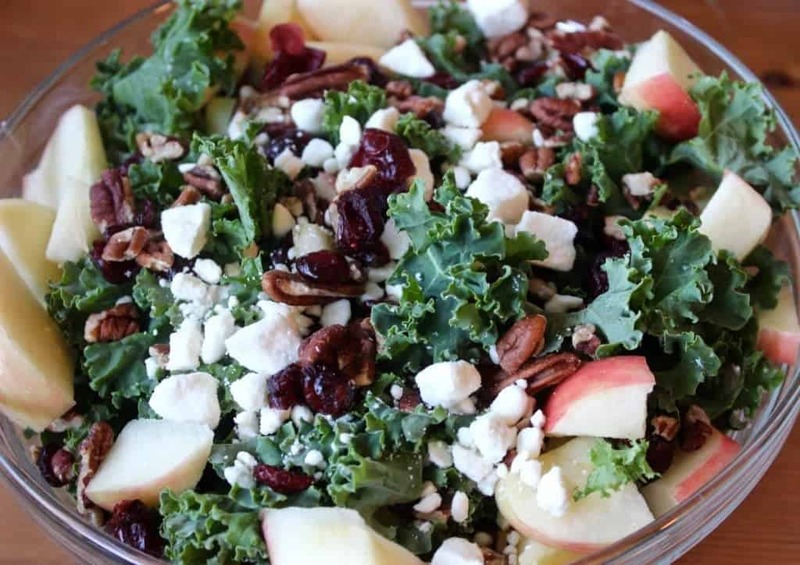 This delicious Kale Apple salad(Not messaged) is dressed with a delicious honey vinaigrette and has pops of feta cheese and cranberries laced throughout. We love comments here at Homemade Food Junkie. Feel free to share your experience with this recipe in the comments below. You motivate us when you share your results with our recipes. We are always here to help you and talk about new ideas or tips you want to explore. Thank you for joining our Homemade Food Junkie community. This delicious Kale Apple salad is dressed with a tasty sweet honey vinaigrette. Pops of feta cheese and cranberries laced throughout add tangy flavor. This healthy salad is Low-Sodium and Gluten-Free. Before you begin, massage the kale leaves if you want them softer. Place the kale in the bottom of a bowl followed by the rest of the ingredients. Whisk together the dressing ingredients and pour them over the top of the salad. Refrigerate after serving and enjoy! Kale message is a process used to soften the kale. We usually eat our raw kale leaves just as they come out of the garden. EXCEPT we pull the leafy part off the kale ribs. The ribs are tough and VERY chewy. The leaves are springy and resilient. If you prefer to have a softer leaf in your salad you may massage the kale. This is done after you remove the leaf off the ribs of the kale. The process takes about 3 to 5 minutes. Put the kale leaf in a bowl with a bit of oil. Now dig in with your hands. Pick up the leaves gently between your thumbs and fingers. Gently massage the kale between your finger until you feel the leaf start to soften. Your kale is massaged as much as you want to continue this process. This salad is great! I love making it ahead of time and instead of apple i use pear and it doesn’t go brown. I also double up on the dressing recipe so that i can always have some on had. Thank you for such a great recipe! Hi Cyprianne, Thank you for Letting us know you love this recipe. We are so glad it’s working for you. What a great idea to double the dressing and keep it on hand. Wonderful salad! My family loved it!! Hi Sandra, Thank you for taking the time to share your family’s love of our Kale Apple Salad. My happy meter skyrocketed reading your lovely comment! I remember the first kale salad I had I was chewing it forever until I learned the little trick of massaging the dressing and the kale first and allowed it to rest. What a difference. I am going to do just that to this beauty! Thanks! Thanks for the great tip kevin. Massaging kale is new to me. We like a crunchy salad with lots of texture, but I may give your trick a try and see what massaging kale is all about! I love the combination of sweet and savory!! Perfect fall combination!! What a beautiful combination of fall flavors. Looks so light, fresh, and delicious. I bought some kale to make a salad with it and this looks right up my street. Definitely a must try! This salad looks delicious! I’m always looking for ways to use kale since it’s so healthy. And the dressing sounds awesome too! Sherri, This is a crisp fresh fall salad with a light, pleasing dressing. Thanks so much for stopping by! This must be so crunchy and satisfying! This salad is full of crunch and satisfying flavor, Khadija. Thank you for stopping by! Thank you Winnie:) It is really tasty!